This class is open to all ability levels. Our true essence is among the trees, the breeze and the natural world. Join Yoga Room teacher Ellie Perry for this all levels flow and dynamic movement yoga class. Ellie will guide you into the breath and with the breath into intentional movements. Granlibakken guests, locals, and students of the Yoga Room welcome! I began my yogic journey in my late teens. 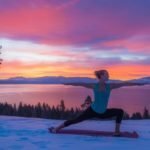 At first, I was drawn to the practice for its physical benefits since I had always played sports, but was soon rewarded with the mental and emotional effects that yoga can have on one’s life. I suffered from anxiety paired with sleeping problems and found yoga to be an amazing alternative medicine. Since, I have received my 200hr YTT in Bali, Indonesia in order to share such a beautiful gift with any and all who are curious. I strive to provide students with classes that are accessible for all levels, while presenting a challenge for each individual. I feel that yoga should be a playful activity that also encourages each of us to grow, both mentally and physically, from the experience. I seek to provide a space in which students can gain awareness as well as insight to the workings of their bodies and minds. No matter the skill level or amount of practice one has, I encourage everyone to come play on the mat with me! I am excited to become part of such an awesome community of yogis and look forward to meeting you! *Some Saturdays are excluded. Please call 530-583-4242 or click here for information.